26/9/10 – Acquisition – Paris, Musée du Louvre – The work which has just joined the Objets d’Art at the Louvre (ill. 1 and 2), thanks to the Amis du Louvre , is not only the most important one to have been acquired in many years by this department but also a major attraction for visitors, a very significant acquisition for the Louvre as well as for French art history since no one had suspected it existed before September 2008. This is a 15th century tapestry, which resurfaced two years ago in a private residence. After being quickly informed, the curators at the Louvre discovered what is no doubt the only royal canopy still preserved today, and moreover, in exceptionally fine condition. 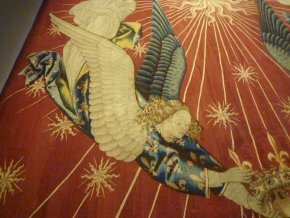 A canopy, according to the dictionary of the Académie Française, is “a work in wood or tapestry set on a chassis, placed as a mark of honour above the main altar in a church, a throne, the seat of a famous figure, etc.”. 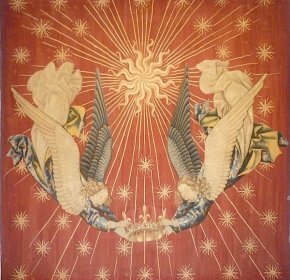 The one acquired by the Louvre represents two angels wearing tunics with fleur de lys holding a crown bearing the same flowers, on a red background displaying a large golden sun with extending rays and a multitude of smaller suns. A stylistic and historical study led to the rapid conclusion that it was Charles VII’s canopy. The tapestry was located behind the king who thus appeared to be crowned by the angels, symbolizing that his power came directly from God. The exceptional state of preservation of the canopy and its historical interest are not the only essential elements of this acquisition. The beauty of the work is absolutely breathtaking and the photographs do little justice to the visual shock experienced when seeing it in the museum. The author of the cartoon has been identified : it was probably Jacob de Littemont, a painter to Charles VII, and author notably of the stained-glass window of the Annunciation in the cathedral at Bourges (around 1450). The canopy can be seen at the Louvre as of 17 September, Richelieu wing, 1st floor, room 6. Coincidences are sometimes eerie. The same day (16 September) this royal tapestry was presented by the Minister of Culture during a short ceremony, another event was taking place at the Palais de Justice not far away, a hearing on the rood screen from Chartres which we often discussed on this site  (see notably this article and this one in French). We cannot help but see a connection between the two cases : in one, a fragment from a rood screen which, when it was destroyed, did not belong to the Crown, was not part of the public domain and had never been proven as such ; on the other, a royal tapestry in good condition. One is claimed, the second is purchased in a very normal way by the Musée du Louvre. Herein lies the difference perhaps : the Louvre would never have made the mistake of claiming this fragment of rood screen. The previous management at Patrimoine , under the direction of the forgettable Michel Clément, set this erroneous process going. We are now seeing the consequences of a double standard. To be absolutely precise, we point out that the real discoverer, who dated it precisely and identified the work, is Pierre-Yves Machault, a tapestry expert and member of the CNES. He found it at the home of a private collector where it was thought to be from the 19th century, and sold it to the Louvre. We regret that this information was not provided in the speeches, nor in the press release. With a contribution from the Fonds du patrimoine and also the Louvre’s own funds. Still in deliberation by judges, a decision will be pronounced on 28 October. This has been replaced, let us recall, by a Patrimoines management which also includes museums and archives.